A broken stick is an extremely rare event, at least if that stick is a Dita! Chipped paint is a cosmetic issue and does not affect the play of the stick at all. Paint can be chipped as a result of hacking or hitting anything but a field hockey ball (this includes other sticks and goalposts). Only play with an outdoor stick on turf or grass. Playing on dirt, in the street, or any other abrasive surface will destroy your stick. Hacking is when a stick is hit instead of the ball. 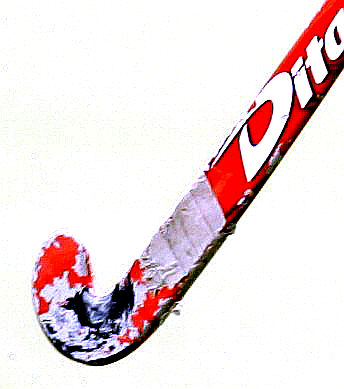 Some damage from hacking can be prevented by taping the shaft with athletic or hockey tape. The best way to prevent damage from hacking is to avoid it all together by passing the ball a little sooner and moving away from players coming in to tackle. Few sports put such a range of stress upon shoes as field hockey. The life expectancy of a pair of turf shoes can be very short, especially if not cared for daily. Always let your shoes air-dry. Your feet sweat and moisture can collect in the seams and below the insole. Our insoles are easily removed for drying. Flip the insoles upside down. If moisture is left in the shoe, bacteria can grow and weaken the junction between the uppers and sole. The constant starting, stopping and quick turns puts a lot of stress on shoes so a little care can go a long way. Always lace and unlace shoes since stepping on the heel to release the foot can cause the heel to crush. NEVER LEAVE YOUR SHOES IN A CLOSED BAG. The laces and insoles are designed to be replaced. A fresh insole can make you feel like you have new shoes. Shoes should be replaced often. Runners log their miles and usually replace them every 3 months. Hockey players should expect to replace shoes as needed based on how often they practice. Shin guards get nasty very quickly. There are a few ways to clean them to decrease smell and eliminate bacteria. First always leave you bag open or take them out to fully dry after practice. No one likes wearing shin guards that are still wet from the last practice. You can scrub our orthos down with gentle soap and then rinse them off well, you can hose them down outside, or you can even put them in the dishwasher without detergent. Some orthos have a removable sleeve. Simply slip the sleeve off from the top down, wash in cold water, and air dry. To put back on, just insert the bottom of the ortho into the sleeve and fold it over the top.